Physical activity refers to any movement that requires your body to exert effort, causing you to engage your muscles. While planned exercise is a highly recommended form of physical activity, it is not the only kind. Every time you stand up, stretch, walk around or clean your home, you are engaging in activity. Physical activity promotes physical and mental health by stimulating blood circulation, enhancing heart health and reducing stress. Activity encourages you to take long, deep breaths, which can help the health of your lungs, as well. There are steps you can take to become more active every day. Whether you have access to a gym or are stuck at work or home all day, there are choices you can make to help you stand-up and move more often. Incidental activity refers to the type of movements you engage in during your everyday routine. Unlike traditional exercise, incidental activity doesn’t require any warm up or preparation. Prior to exercising, you may change your clothes, fill your water bottle, put on your sneakers and stretch. Incidental activity is done anywhere, anytime, often with little notice. The American Heart Association recommends that everyone exercise for at least 30 minutes, five times a week. This adds up to 2.5 hours of exercise every week, and you can reach this number in many different ways. Consider taking 10-minute walks, two to three times a day, or spending 15 minutes of your lunch break engaging in light activity. Spend time on the weekend with your family, enjoying local parks or walking trails. When increasing your activity level, take it slow. 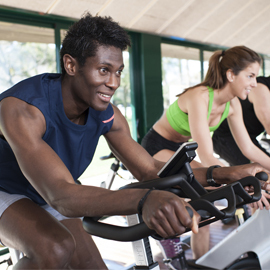 Low to moderate intensity activities are ideal for those who are just starting. This includes walking, swimming, casual bike riding and leisure activities like golfing.